If you haven’t heard of kombucha, it is a fizzy drink made by fermenting sweet tea with mixture of bacteria and yeast. Not only does it have a distinct taste, but it also provides a number of health benefits, including boosting the immune system, increasing digestive health, losing weight, and lessening depression. 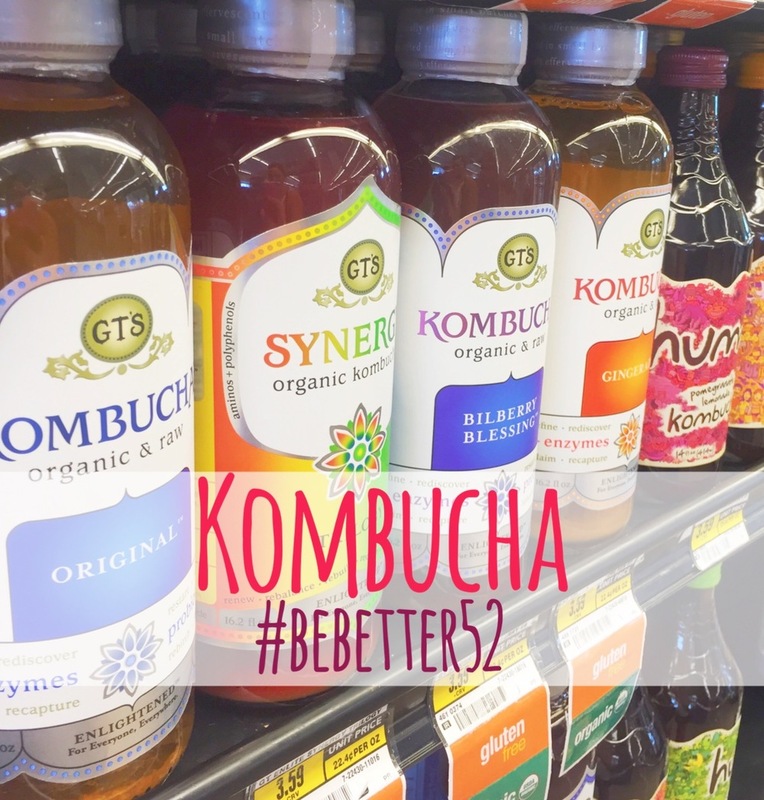 This week’s #bebetter52 challenge: Drink kombucha. If you have never tried kombucha, pick up a bottle from your local grocery store and try it out. The drinks have a distinct taste that can take some getting used to, but try to finish at least one bottle this week. Your body will thank you. Kombucha has been around for over 2,000 years and originated in China. The Chinese referred to Kombucha as the “Immortal Health Elixir” because of the countless health benefits it provides. Many diets use kombucha as a way to detox the body from harmful molecules such as free radicals and to counteract liver cell toxicity. A strong antioxidant known as D-saccharic acid-1, 4-lactone (DSL) is created during the fermentation process and helps maintain a healthy immune and digestive system. Kombucha has many other health benefits including cancer prevention and candida (harmful yeast) overgrowth, joint care, higher energy, detoxification, mental clarity, mood stability, and weight loss. Most of these health benefits are due to the high amount of antioxidants kombucha creates during the fermentation process. A bottle of kombucha a day can do wonders for your body, but this week we will just start with one. Kombucha comes in many flavors such as raspberry, strawberry, guava, ginger, and many more. This week, experiment with kombucha, find the flavors you like and try to make this “Immortal Health Elixir” part of your diet. For those brave enough to make their own, here's a Kombucha Recipe. We live in a time when everyone is searching for the “new best thing.” Whether it’s the newest technology, the newest car, or even the newest style, there is always something new to buy. This week’s #bebetter52 challenge: Look at your old possessions with an innovative eye. Get crafty and find a fresh use for an old picture frame or a worn-out chair. This week is all about focusing on what you already have and creating something new. Instead of buying a flower vase, wrap colorful paper or string around an empty wine bottle. Don’t throw out that old pair of jeans. Turn it into a bag or a pillow or even a pair of jean shorts. Have an old sunglass case? Transform it into a miniature sewing kit. Whatever the item may be, with a little creativity, it can become something new. Next time you are in a store about to make a purchase, ask yourself, “Can I make this item with what I already have?” If the answer is “yes,” you are not only saving money but also saving yourself from wasting perfectly good items. Pinterest is always a great place to look for fun ideas! Food is an essential part of our lives. Our bodies will not function without a proper amount of nourishment. As of 2014, 14 percent of American households faced food insecurity. Millions of families across the U.S struggle on a daily basis to place a meal on the table. In honor of the 24th annual letter carriers’ Stamp Out Hunger food drive on Saturday, May 14, this week’s #BeBetter52 challenge is to donate food. If you leave nonperishable food items out by your mailbox on May 14, your mail carrier will pick them up and take them to your local food bank or homeless shelter. You may also hand-deliver food donations to your nearest food bank or homeless shelter throughout the week! In 2015, the Stamp Out Hunger food drive collected approximately 71 million pounds of non-perishable food left out by mailboxes. The drive has collected more than 70 million pounds of food for 12 consecutive years – for an overall total of more than 1.4 billion pounds of food. Many people only think to donate food during the holiday season, but those in poverty struggle throughout the entire year to have enough food to eat. Even if you only have one can of food to give, you can make an impact. Check out http://www.foodpantries.org/ to find a local food pantry/food bank near you. This week’s challenge is a great way to give back to your local community, all while raising money for Every Mother Counts. We can’t wait to see the impact you have on your community. With May here and summer approaching, what sounds more refreshing than a smoothie? Not only are smoothies refreshing and enjoyable, but the fresh fruits and vegetables are filled with vitamins, minerals and fiber. 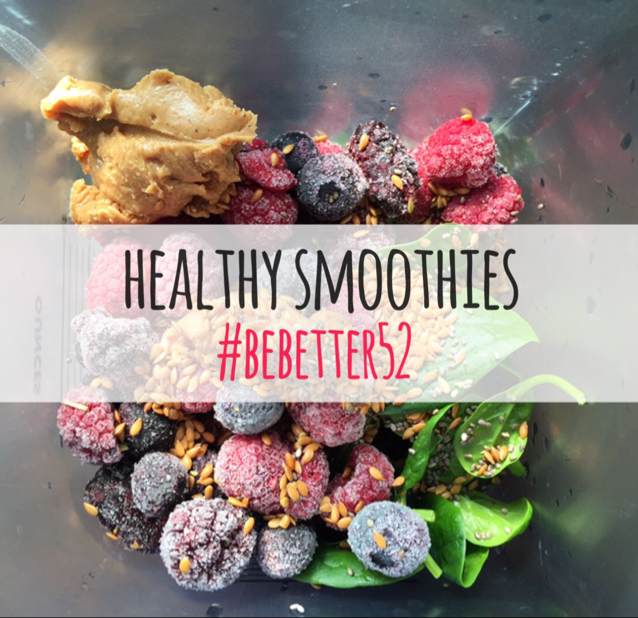 This week’s #bebetter52 challenge is to consume a healthy smoothie. You can drink it first thing in the morning to absorb all the nutrients or enjoy it as a treat after you work out to help rebuild your muscles. The important part is to make sure the smoothie is as healthy as possible! Making a healthy smoothie isn’t difficult; you probably already have a lot of the ingredients in your kitchen. First you need a base. The best and healthiest bases are almond or coconut milk, fresh fruit juice, or simply water. Be careful not to use conventional yogurt or juice because of the artificial flavoring and extra sugar. Next, add fruits and veggies. Suggested fruits include strawberries, blueberries and pineapple. Bananas add a nice texture to the smoothie and complement all other fruits. For vegetables, spinach or kale are flavorful and give the smoothie a boost of energy. We suggest using frozen fruits to make your smoothie cold instead of using ice cubes. Nuts and seeds will add extra nutrients to your smoothie. Almonds, peanuts, chia seeds and sunflower seeds are among the most popular. If you feel daring, you could even add a little peanut butter. The last step is to add a supplement powder. Try to use plant-based proteins for maximum health benefits. Feel free to be as creative as you want and to make the smoothie your own! As long as it is healthy, you are completing the challenge. In 2014, 378 people paid it forward at a Starbucks in Florida. This act was started by one woman who was simply trying to brighten someone’s day. Little did she know it would set off a chain reaction and lead to a profound impact on her community. We see so much negativity in the world that we forget that the simplest kind gestures can make the biggest of impacts. This week’s #BeBetter52 challenge is to it pay forward to 3 or more people! This is a great opportunity to make a positive and profound change on the world around you. With each act of kindness, you complete, you will be helping to create a more compassionate society. Thursday, April 28th is known as International Pay It Forward Day. In 2015 people from 75 different countries participated and made a positive impact on those around them. Regardless of where you live, what you do, or whom you know – you are constantly surrounded by opportunities to pay it forward. Have fun this week Be Better and be sure to come up with some creative ways to pay it forward! Put money in a parking meter that is about to expire. Pay for someone’s book at a bookstore.